Armin Zoggeler is one of those athletes who seem to reserve their best performances for the Olympics and the Italian luge master goes to Vancouver looking for a third straight title. But he'll be 36 in Canada where his main threat should come from 2008 and 2009 world champion Felix Loch, the German youngster who has been snapping at his heels in recent seasons. But Zoggeler, with his eight World Cups, five world championships and two Olympic titles, not to mention his silver at Nagano 98 and bronze at Lillehammer 94, should have the nerve and experience to keep Loch at bay in Vancouver. 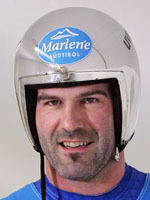 Having deprived previous great luge champion Georg Hackl of a fourth straight gold at Salt Lake in 2002, ending the German's long reign at the top, Zoggeler will be fully aware the tightest of clasps on a title can be loosened by up-and-coming talent. Hackl's tale is a cautionary one of course as he was humiliated at Turin 2006 where he could only manage seventh, bowing out as the man who had stayed too long instead of going out at the top with his dignity fully intact. The Italian, who grew up in the northern Italian town of Merano, took part in his first World Cup race when he was just 15, and confirmed his early promise by winning bronze at the Lillehammer Games in 1994. Fans saw his hunger for success early on, calling him 'the Cannibal'. The Italian policeman's rise to the top was steady, a world title at 21 at Lillehammer again in 1995 being the first in a long series of wins that led to the toppling of Hackl on the Olympic stage at Salt Lake. And although Hackl has gone now Zoggeler's story is still intertwined with that of his predecessor as now he'll be tilting at the German's record of three straight Olympic golds. Zoggler's recent form suggests it will be tight out in Canada. He won the European championships of 2008, edging Loch into second, but at the 2009 worlds at Lake Placid, New York Loch won by a clear margin ahead of Zoggeler in second. The gold medal may be decided on the mental grit of the title holder pulling him through, or perhaps on the burning desire of the newcomer to reach the very top on the greatest stage of all.